Taste some of the finest coffees grown in the world!!! Oliver is coming, Oliver is coming!!! 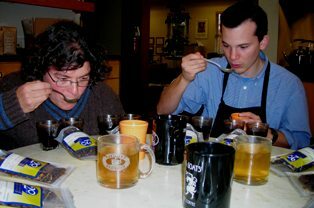 Oliver Stormshak, educator and trainer, from our coffee roaster, Batdorf and Bronson, in Olympia, WA. will be visiting Tazza D’Oro this weekend to continue the training and certification of our employees. On Sunday, Feb 11th from 3 to 5:30 pm we will hold a traditional coffee tasting for our employees and customers. You will have the opportuinty to experience a “real” cupping and taste some of the finest coffees produced around the world and roasted to perfection by Batdorf and Bronson. As part of the cupping, Oliver will also present a slide show called “Seed to Cup”. It’s an awesome presentation that explains the growth and production of coffees around the world and the partnerships our roaster has with many of the growing farms. Space for the cupping is limited and the cost is $10.00. Please email me at tazzadoro@earthlink.net, or call 412-362-3676 to reserve a space. I promise, you are going to love this event. We will also serve some complimentary brandy and cognacs after the event to sip with your coffee.